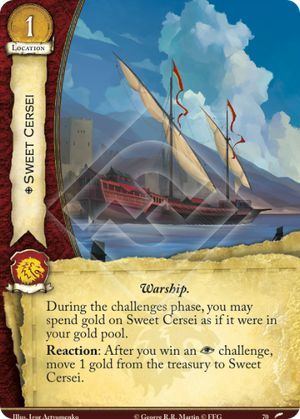 During the challenges phase, you may spend gold on Sweet Cersei as if it were in your gold pool. Reaction: After you win an challenge, move 1 gold from the treasury to Sweet Cersei. Favor of the Old Gods #70. Spend refers to any ability that allows a player to choose to pay gold (e.g. marshalling a card or playing an event) or move gold (e.g. bestow) from their gold pool.